Arrive in Kathmandu meet our staff and transfer to hotel in Kathmandu, at 7-8 pm group meeting and tour briefing at hotel, check quipments, overnight in Kathmandu. Day 02: Fly to Lukla & trek to Chutang (3450m), overnight at lodge (B/L/D). Early in the morning flight to Lukla. It takes around half an hour flight to reach Tenzing and Hillary airport Lukla. Lukla is a small city in the lap of High Mountain. It is commence point of our trek. To meet Asian Hiking Team crews. After having breakfast we start our trek to Chutang. The trial goes straight from lukla up to 1 hour then slightly ascent up to Chutanga. 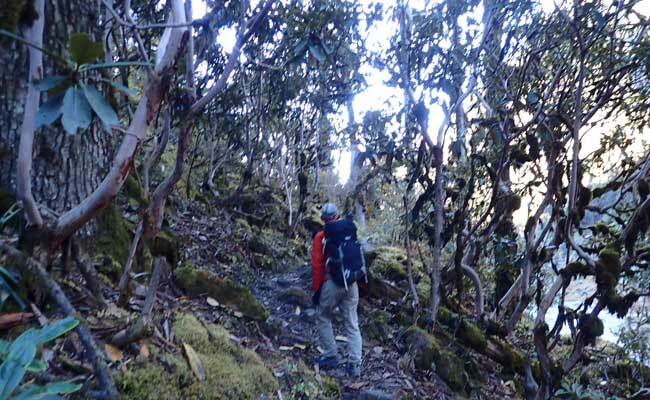 We have to walk through the pristine of Rhododendron (National flower of Nepal) and pine. It takes around 3/ 4 hours from Lukal to Chutang. Day 03: Chutanga to Zatra La Pass 4600m to Thuli Kharka, Overnight at Lodge (B/L/D). After breakfast we continue a long day walk around 6-7 hours crossing the Kalo Himal Ridge that separates the Khumbu from the Hinku valley that lead across this ridge is the Zatrwa La, traversing to the right and finally descending steeply to ThuliKharka (big pasture) where there are several basic lodges, overnight in Lodge. Day 04: Thuli Kharka to Kothe 3680m, Overnight at Lodge (B/L/D). After breakfast, the trails bring you up and down valley. We pass Chterwa, Tashing Ongma to reach Mosom Kharka. 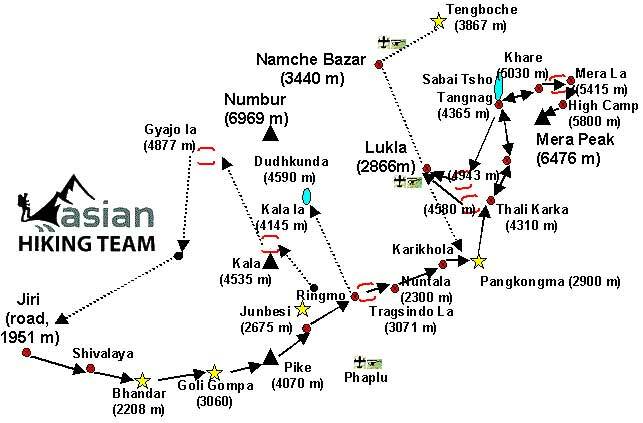 Today we have lunch in Tashing Ongma than gragually climb to Mosom Kharka, 4/6 hours, Overnight at Lodge. Day 05: Kothe to Tangnag 4355m, overnight at Lodge (B/L/D). Trial goes slightly up through the bank of Inkhu Khola. On the way nice view of Mt. Charpate and Mera La. On the way we can see a Buddhist Gomba in the lap of big rock, it take 4/5 hours trekking to Tangnag, overnight in Lodge. Day 06: Rest day in Tangnang, overnight in Lodge (B/L/D). Today is the rest day in our trekking, so you can get up bit late and have breakfast then walk around the valley. Either you can go the Tangnang Glacier or the lake Sabai Tsho Lake, return to Lodge and overnight. Your can talk with Asian Hiking team Guide and decide where you want to explore. Day 07: Tangnag to Khare Camp 5095m, overnight at Lodge (B/L/D). Today the trial slightly goes up around half an hour up to Dig Kharka, which offers breathtaking view of Mt. Charpate. The routes continue slightly up towards Khare Camp. There is small Sherpa village which offers nice accommodation which situated in sloppy land surface, overnight at Lodge. Day 08: Khare Camp - Rest day for acclimatizing and pre-training, (B/L/D). Today also rest day in your trekking so either you can visit the Mera peak base camp or you can safe your energy for climbing, see how the condition than you can decide. Learn and practice how to use equipment and safety. Overnight in Lodge/Hotel. Day 09: Khare Camp to High Camp 5800m, tented camping (B/L/D). After hot breakfast, start walking on the way to Mera Base Camp. We need to cross Mera Glacier, and then we have to walk straight on ice around half an hour. On the way see the nice view of Mera peak. After descending around 100m, we will be at Mera Base camp 3 hours. From Base camp we have to climb up towards High camp. The way was covered with ice. On the way we can see nice and spectacular view of Mt. Everest (8848m), Mt. Cho Oyu ( 8201m), Mt. Lhotse (8414m), Mt. Kanchenjunga and many more. High Camp is situated in the base of big rock, where we can fell quite warm, which offers nice view of sunshine and sunset, 2 hours from Base Camp, overnight at tented Camp. Day 10: High Camp to Mera Peak Summit (6654m) return to Base Camp or Khare Camp, overnight Camp (B/L/D). Today is most valuable day. We wake up around 1 am, prepare the all climbing gears. After hot breakfast we start to climb up. Slowly and gradually we continue climbing. If the weather is favorable, we will be at Mera central summit around 4-6 hours. Anyone can easily forget the tired when they were in summit. From the summit of Mera you can see the magnificent and breathtaking view of high mountain ranges like; Mt. Everest (8848m) and Mt. Lhotse (8501 m), Mt Nuptse ( 7855m), Lobuche peak( 6145m) to the north , Mt. Choyu ( 8201 m) and Mt. Amadamlam ( 6818 m) to the west, Mt. Kanchenjunga (8586 m) , Mt. Makalu ( 8463 m ) to the east, and many others. After spending around half an hour in summit then we start to descent down to High camp. 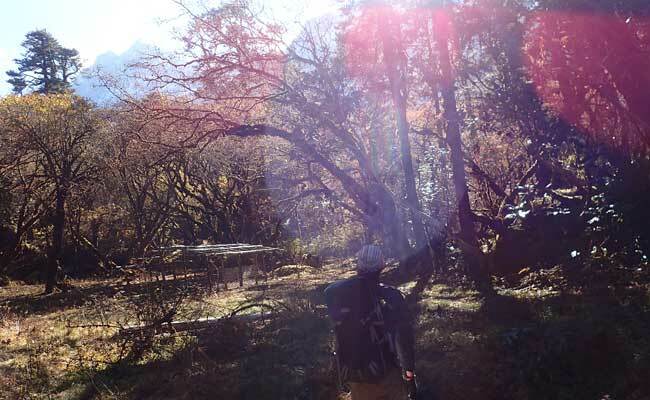 Continue descending to Base camp, overnight Base Camp or Khara Camp if you are ok and desire, overnight Camp or lodge. Note: Asian Hiking Team give you options either you can stay in Base Camp or in Khare Camp because of many of climbers return to directly Khare Camp. 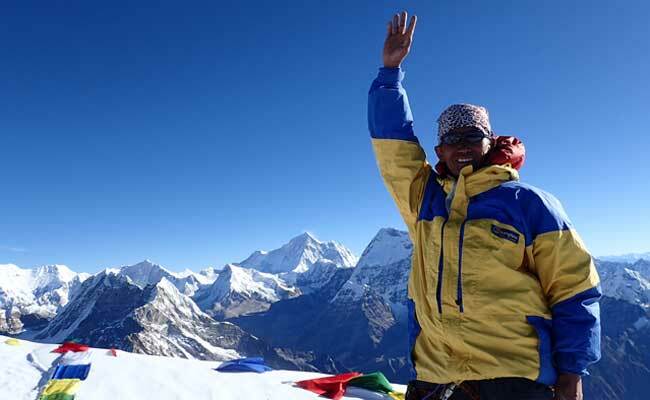 As well as we have not make a Camp in Base Camp because of Khare Camp to High Camp is possible and its the best. 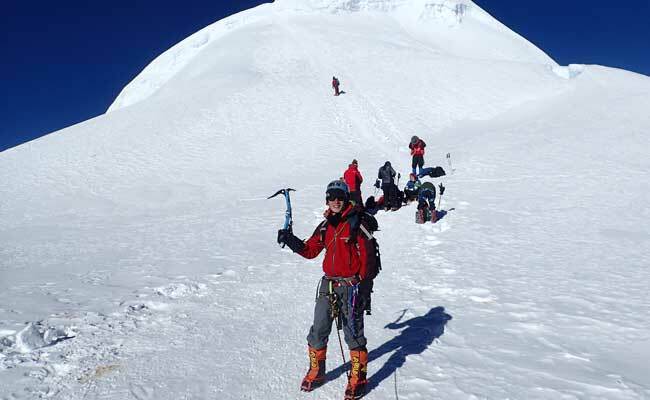 Many climbers suggest us one or two nights only camp and summits Mera Peak. However if you want to stay Base Camp at first and after summit let us know. We operate climbing same cost even you want to stay one extra night in Camp. Day 11: Spare day (any mishap - either flight or weather or mountain sick or any you can use that day). 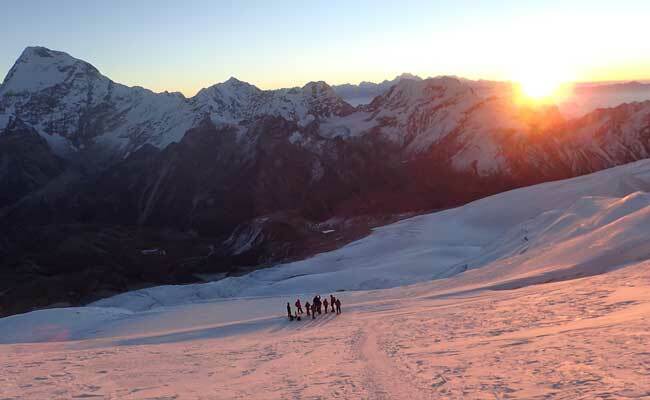 Day 12: Khare/Base Camp to Kothe (3600m), 5-6 hours, overnight Lodge (B/L/D). We trek from Khare to Kote along the same trail used previously. After reaching Kote relax and rest, It takes 5-8 hours, Overnight at Lodge. Day 13: Kothe to huli Kharka, overnight Lodge, 5-6 hours (B/L/D. We walk on a trail next to the Inkhu Khola. After walking a little further away from Mosom Kharka, we cross a bridge over the Inkhu Khola. Shortly, we cross another bridge over Sanu Khola. We pass through Tashing Dingma to reach Thuli Kharka. We spend the another night in Thuli Kharka, overnight at lodge. Day 14: Thuli Kharka to Lukla 6-7 hours, overnight Lodge (B/L/D. We cross the Zatrwa-La pass at 4,600. As soon as we cross the pass, we are welcomed by the sight of the beautiful Lukla Valley which is surrounded by Cho Oyu, Kongde Peak, Numbur Himal, Kusum Khanguru and other Himalayan peaks. From Zatrwa La pass we walk all the way down to Chutang and then straight forward to the Lukla village. In the evening we enjoy last dinner in the Himalaya with our crews, overnight in Lukla at hotel. Asian Hiking Team staff provide you have early breakfast and drop to Tengjing Hillary Airport as our flight schedule own way flight to Kathmandu. It is 30 to 45 minutes flight to Kathmandu than transfer to Hotel in Kathmandu. After your arrive Kathmandu, you are free and relax as you want, overnight at Hotel. Day 16: Last minute, transfer to Airport for your onward journey or next trip (B). The trip end today, our airport representative will drop you to the Kathmandu International Airport for your flight departure from Nepal.